That was… strange. Sitting down to view director Pierre Laffargue’s crime opus ‘Black’, you might think that you are in for a thrilling heist flick, filled with cool music, beautiful women, shady characters and lots and lots of action. And you are in for that… plus a little more. Like spiritual soul possession and demonic overlords. Foreign movies man… they can get away with this stuff because most of this would never fly in the U.S. of A.
Dateline Paris. 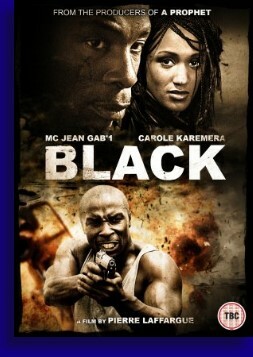 We meet the character of Black (MC Jean Gab’1) and his crew, disguised as garbage men, poised to rob a bank. On the way to the heist, an old lunatic observes the mark on Black’s face and proceeds to shout out sage, loon filled prophecies about my man’s destiny, which Black naturally treats with derision. The man is a lunatic for goodness sakes. Regardless, this heist goes all to hell, Black’s boys are all dead and Black is on the run. Note to self, do not rob banks in Paris because Parisian cops have lightning quick response times in addition to access to automatic weaponry that they are not afraid to use. Since that criminal endeavor crapped the bed, imagine Black’s glee to hear from his cousin in his native Senegal who has informed him that some guy has dropped off a boatload of diamonds at the poorly guarded, antiquated bank that he works at. I was thinking that maybe Black should lay low considering how his last heist attempt went, but I’m not a Senegalese bank robber, so what would I know. So with cool soul music playing in the background, Black rounds up his crew and is off to Dakar to get paid. In theory. wants in on the action. And don’t let us forget about Degrand’s lady love, the witch Fatoumata (Mata Gabin), will do just about anything to help her man get in on this action, not to mention her cure for his psoriasis. Chances are if we’ve met them in this movie, then this person is willing to kill, maim, lie and cheat to get these stones. As explosive, action filled circumstance would have it, Black ends up with the stones but the downside of this is that he also ends up handcuffed to an impossibly beautiful foe in Pamela the hostile Interpol agent (Carole Karemera) who has every intention of seeing Black rot in prison. Impossibly beautiful. Not that her good looks and supreme athleticism is going to help her wrap up the crime of the stolen diamonds or cart Black off to jail because right about now every criminal, thug, native, strongman and mercenary is chasing this pair around the slums of Dakar to get these stones. Normally I would inform you that everything hits the fan and it comes to a big shootout, but I can’t do that here. Remember that crazy old guy? Remember the scar on Black’s face? The guy with the bad case of psoriasis? Lions, black panthers, venomous snakes and kung fu will all play a part in one of the stranger movie climaxes I think I’ve ever seen. I had read in some spots were Pierre Laffargue’s ‘Black’ is compared to some old school blaxploistation films, which in all honestly is a little inaccurate. I had also read were ‘Black’ is compared to ‘Shaft’ which it probably has a closer relationship to, since ‘Shaft’ really wasn’t a blaxploitation film, just a crime thriller filmed in the ‘70’s starring a black guy. Nonetheless, whatever you want to compare it to, ‘Black’ is unique, that’s for sure. I think that this is the first film I’ve personally seen coming out of France that is dominated by a majority black cast and as an action thriller Laffargue certainly has all of his ducks in a row. We have a cool, dynamic leading man in MC Gab’1, an exciting and exotic leading lady in Carole Karemera, plenty of rotten bad guys, explosions, fist fights, car chases, shootouts, intrigue and a few more explosions to top it all off. Then things start to get a little weird, a lotta weird actually and here is where ‘Black’ will either lose you in its sea of mysticism or make you leap off your seat and proclaim Pierre Laffargue as the next great genius. Personally I’m kind of in the middle. The fact that this movie completely loses itself with the mystical element wasn’t an issue for me. When we were first introduced to the old crazy dude shouting nonsense, I was pretty sure that somewhere along the line that ‘Black’ was going to make a sudden left turn at some point, plus it’s a French Movie, and while the whole panther, snakeman, lion thing was a might seem a bit odd, at the very least it kept you guessing which direction this movie was heading towards. The issue I had with the mystical element of this movie, for one, would be the way that Laffargue shot the sequences with the extreme close-ups for some sections, the negative blue hues for others, with the frenetic camera movements for just about all of these sequences making it hard for me to make out what was going on. Another is that this movie was about ninety five minutes of an action thriller with ten minutes of mysticism placed at the end which meant we didn’t get a lot of exposition about why Black is the Lion, how the snakeman and the panther figure into the picture, and what does any of this have to do with stolen diamonds. If the snakeman triumphs are we all doomed? Is he really bothering anybody on his island being a snakeman? Still, with its cool soundtrack, cool characters, fast pace and of course the mere presence of Carole Karemera, ‘Black’ still shakes out to be a damned entertaining heist movie. Weird, but entertaining. Kind of like that bum on the corner we like to hang out with.